HWLH News Letter for October, 2014- Issue #0011 - Are Arificial Sweeteners Bad For Us? October Issue # 011 - Are Artificial Sweeteners Bad For You? In other words, when it comes to the food products we buy, they are only as safe as the quality job the FDA has done by testing those items and making sure they are safe for us to put on our dinner tables. So hopefully all products that we buy for consumption have been tested and proven safe. And it's no wonder because they offer a great way for us to still enjoy the sweetness of foods and beverages while decreasing our daily calorie intake. A genius concept if you ask me. These artificial sweeteners are found in an abundance of products available today. These sweeteners provide us with "sugar free" products such as chewing gum, soft drinks, juices, baked goods, yogurt, candy, ice cream and so many more. According to the National Cancer Institute there is no concrete evidence that proves that artificial sweeteners present any health problems at all. The latest accusation is that sugar substitutes can cause weight gain. Though many have stated that their tests show this to be true, no real evidence yet has been provided to back this up. It is derived from sugar and offers an almost calorie free solution. It was discovered in 1976 and approved by the United States government in 1998. Splenda can be used as a sugar substitute that can replace sugar in cooking and baking. Though this type of sugar cannot be caramelized it offers the same sweetness as sugar does without any artificial after taste. 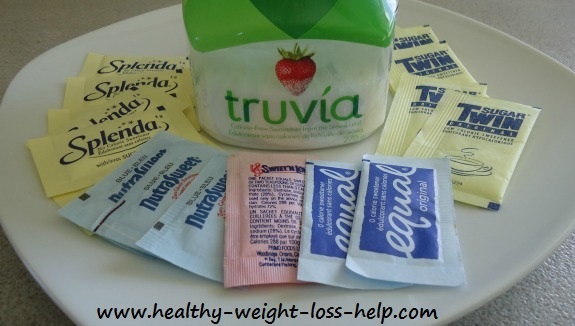 Truvia seems to be the latest trend when it comes to sweeteners. Its ingredients are erythritol (a sugar alcohol which is naturally found in fruits), extracts from the stevia leaf and natural flavors. The main misconception of this tabletop sweetener is that it is all natural which is not true. Though it does use some natural ingredients it is still highly processed like the others. Truvia got its FDA approval in 2008. However, some UCLA toxicologists wrote a letter to the FDA stating that some of their lab tests showed that Truvia may cause mutations and DNA damage and they feel that further testing of the sweetener should be done. So until further testing is done consume Truvia in moderation. They make a variety of beverages and baked goods taste great. What a fantastic way to improve the day. So if you're a fan of artificial sweeteners, keep on enjoying the sweet benefits they provide.